This is needed to specify the spin isotope information for each spin in the system, for example if the data is from 15N, 13C, 1H, etc. 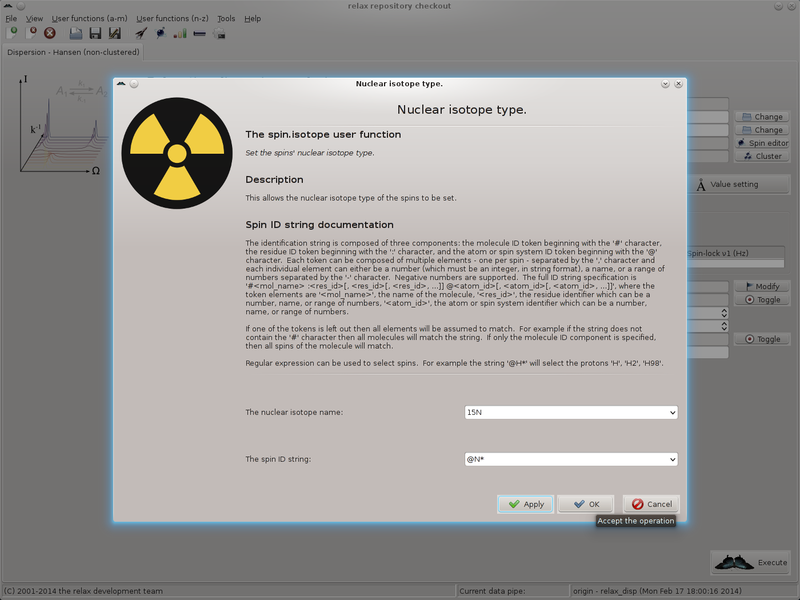 The button launches the spin.isotope user function (see section 17.2.226 on page ). This is used to load a text file containing R1 relaxation data for each spin of interest (see Chapter 5 for calculating R1 values). The button launches the relax_data.read user function (see section 17.2.155 on page ). It is currently only used for handling off-resonance effects in the R1ρ-type dispersion data but may be extended, in the future, to handle off-resonance effects in the CPMG-type experiments. As with the R1 button, this is for properly handling off-resonance effects in the R1ρ-type dispersion data. The button launches the chemical_shift.read user function (see section 17.2.23 on page ). This button launches the interatom.define user function (see section 17.2.58 on page ). This is needed to link, for example, 1H to 15N spins into a spin system so that MMQ-type data, which relies on a multiple-spin system, can be handled. When one of the parameters of the dispersion model is already known, its value can be set by clicking on this button which launches the value.set user function (see section 17.2.268 on page ). Setting a parameter value will fix the parameter in the initial grid search. However it will be free to vary in the non-linear least squares optimisation used to refine its value. In this case, all spins are 15N. However as no spins are named yet, the text “@N*” cannot be used. So simply change this to “@*” and click on “OK”. The other buttons can be ignored.